If you're having trouble sleeping, catching up on zzzs may be as easy as switching up your dinner plate. You're running on empty and you can't wait to finally collapse into bed after a long, exhausting day. You run through your sleep rituals: change into your pajamas, put your iPhone on Night Shift, switch off the lights and then: nada. You just can't sleep. You've shut everything off except yourself. More than one-quarter of the U.S. population reports occasionally not getting enough sleep and nearly 10 percent have chronic insomnia, according to the Centers for Disease Control and Prevention. But if you're having trouble sleeping, catching up on zzzs may be as easy as switching up your dinner plate. Food is Mother Nature’s natural sleeping pill — you just need to make sure you’re choosing the right things to nosh on. Contrary to popular opinion, a glass of warm milk before bed won’t send you into a deep slumber. “Some foods contain nutrients that may help us to relax, while others have components that may interfere or prolong digestion leading to delayed relaxation,” says Melissa Rifkin, RD. Those foods that make you sluggish or relaxed during the day, like white bread, milk chocolate, bananas, cherries and chamomile tea, are the ones you want to reach for at night, she says. And those foods we reach for to get us through the day? Coffee is off the list, obviously, but you should also avoid other energy-boosting foods, such as water, almonds, chia seeds and whole-wheat bread along with sneaky culprits such as alcohol, aged cheese, red meat and dairy-based ice cream before you hit the hay. Getting to a place of slumber is also highly influenced by what relaxes you and that includes your diet, says Timothy A. Roehrs, PhD, a senior bioscientist at Henry Ford Health System, professor of psychiatry at Wayne State University and researcher at Henry Ford Hospital Sleep Center. Contrary to popular opinion, a glass of warm milk before bed won’t send you into a deep slumber because of the properties in the milk, he says. But, if the warm milk actually helps you relax and calm down then that’s what will put you to sleep. Another factor to consider is the timing of your last meal or snack of the day. If you eat right before you sleep, your body will be primed for digestion, which can disrupt sleep otherwise. Similarly, if you drink water right before bed, your body’s filtration system will fire up and you’ll need to wake up more often to go to the bathroom. “While there are foods that can help us to relax, the best option is to eat the lightest meal before bed (preferably two hours before bed) and avoid alcohol and stimulants such as caffeine, as these will interrupt our relaxation and sleep patterns,” says Rifkin. Try these five sleep-inducing foods and recipes that may just help you settle down to sleep. Count on chickpeas to guide you to a worry-free slumber. The legume is loaded with vitamin B6, a water-soluble vitamin that can raise serotonin levels which helps induce sleep. In this recipe, roasted chickpeas are added to a salad mixture of wild rice, cauliflower, onion, kale, carrots and sun-dried tomatoes, then topped with a vinaigrette. Fresh and light for an evening meal! Nosh on these turkey rollups for lunch or make as a light dinner, the tryptophan will do the rest. Tryptophan is an essential amino acid which is used in your body to make serotonin, which is then used to make melatonin and cause you to feel sleepy, says Rifkin. Grab slices of your favorite deli turkey, spread with hummus and add your favorite sliced veggies for a refreshing crunch! This light and refreshing summer salad will soothe you right to sleep. Choosing white bread is the key, says Rifkin. “White bread breaks down into glucose (sugar) during digestion and causes a blood glucose spike which can make you feel a solid energy crash.” Tomatoes, onions, cucumbers and fresh basil round out this dish. Start fluffing those pillows! Ditch that nightly tub of Ben & Jerry's. Ice cream is a sneaky culprit that will keep you awake, says Rifkin. “Consuming foods that are high in fat right before bed often lead to disrupted sleep,” she says. 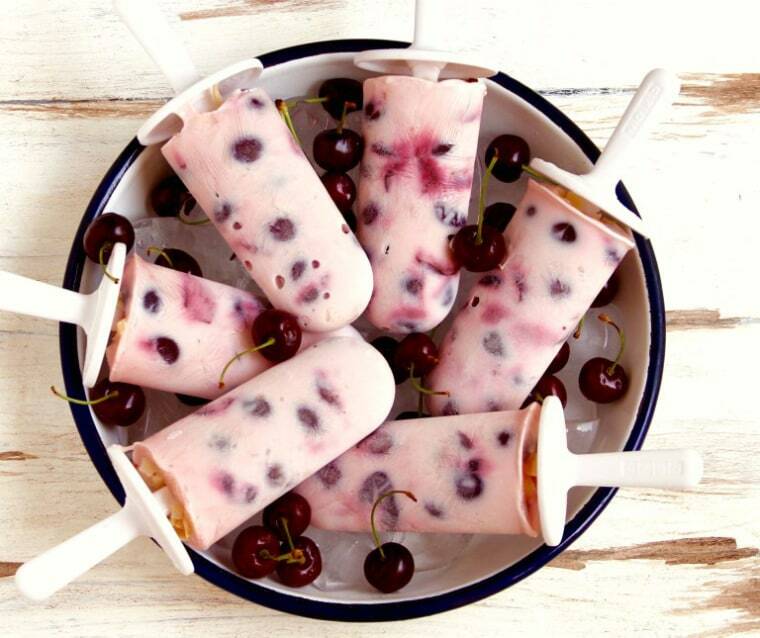 Opt for these healthy cherry yogurt popsicles for a nighttime natural treat for your sweet tooth. “Cherries are one of the few foods that are naturally high in melatonin, a hormone produced in the brain that regulates the sleep-wake cycle,” Rifkin says. The popsicles only take 10 minutes to prep and include only four ingredients: cherries, toasted coconut flakes, honey and Greek yogurt. If you can’t give up ice cream though, get a double dose of sleep-inducing foods in this healthy “ice cream” recipe with cherries and bananas. Bananas, popularly known for being rich in potassium, are also a great source of magnesium, says Rifkin. “Together, the potassium and magnesium in bananas act as muscle relaxers” she says. To make, blend frozen cherries and frozen bananas with a splash of almond milk and grab a spoon!